RIHC has conducted various Seminars & Workshops, which help the students to interact with key personnel from the industry and also help to be up to date with the modern trends in the Hospitality Industry. Successful completion of “Hunar Se Rozgar Programme” in Food-Production & Food & Beverage Service - organized by Govt. of Orissa. Hunar Se Rozgar Programme are Short Term Programmes offered under the Capacity Building for Service Providers Scheme and helps gen erate employment for the unemployed youth in the Hospitality Sector. 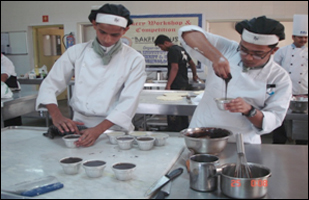 It provides support to bridge the gap between the demand and supply of trained personnel in the service industry. Winner of Basant Puspa Pradarshani – organized by NALCO, Bhubaneswar. This Flower show as the name suggests is being organized each year by NALCO and thus promotes a feast to the eyes for all garden lovers . RIHC, keeping up to the trend of the previous years has again bagged the FIRST PRIZE in all three categories- FLOWER ARRANGEMENT, BOUQUET & RANGOLI Competitions wherein the students of the 2nd Year participated and took the Institute to the pinnacle of success. In the Inter Hotel Management College Cricket Tournament which is being , organized by RIHC, Bhubaneswar, consecutively for the last Three years, RIHC landed up with the Runners-up Cup which was given away by Mrs. Ranjita Rout,the Chief Guest of the Show. 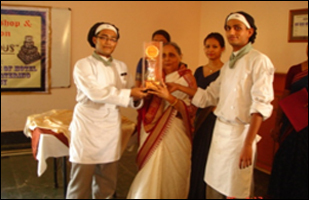 Ranjita Institute of Hotel Management is incidentally named after her. But the true leaders of the show were Biju Pattnaik College of Hotel Management who won the Winners Trophy in a befitting match. Visit of Inspection Committee from NCHM&CT & Govt. of India, Ministry of Tourism, Noida. RIHc also boasts of it SPICE GARCDEN, - distributing to local market.